MANCHESTER (Sporting Alert) — Manchester City manager Manuel Pellegrini is still trying to come to grip with his team’s disastrous performance against CSKA Moscow in the Champions League on Wednesday night. The English Premier League champions suffered an embarrassing 2-1 defeat at Etihad Stadium, on a night when they were reduced to nine-man after midfielders Fernandinho and Yaya Toure were both sent off in the second half. The shocking defeat now leaves City bottom of Group E with two games to go and on the brink of crashing out of the elite European competition at the group stage. “It’s difficult to understand why we played such a low performance today,” Pellegrini said during an interview with BBC Radio 5 live after the game. “We played well against Manchester United at the weekend and we had a chance to win here at home. “But if you give away two poor goals, you make it hard for yourself. “It’s not my place to criticise the referee, especially in this game when his mistakes weren’t just the difference in the result. He added: “I think we cannot play the way we played today if we want to win. 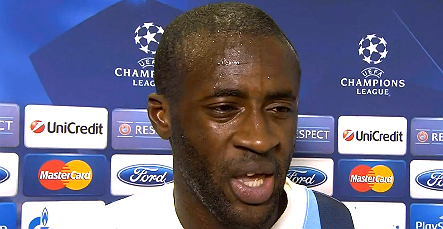 Seydou Doumbia netted both goals in the 2nd and 34th minutes in the victory for CSKA Moscow, while Toure had grabbed an eighth-minute equalizer for City. Manchester City must now beat Bayern Munich and Roma in their next two games to qualify for the knocking phase and Pellegrini thinks it can still happen. “If you have the mathematical option to qualify, you must fight for them,” The Chilean said. “We must first try to play against QPR, then we have the international break and then we are going to try to qualify for the next stage.